Master Disconnect Tool Set 3/8″, 1/2″, 5/8″, and 3/4″ disconnect tools for Ford and Chrysler A/C line service. 3/8″ and 1/2″ disconnect tools for Ford fuel lines. 5/8″ disconnect tool for Ford heater hoses. 5/16″ and 3/8″ fuel line disconnect tools for GM and Chrysler. Transmission oil cooler line disconnect for Ford and GM vehicles. 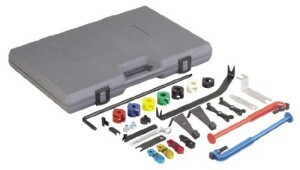 Master Disconnect Tool Set 3/8″, 1/2″, 5/8″, and 3/4″ disconnect tools for Ford and Chrysler A/C line service. 3/8″ and 1/2″ disconnect tools for Ford fuel lines. 5/8″ disconnect tool for Ford heater hoses. 5/16″ and 3/8″ fuel line disconnect tools for GM and Chrysler. Transmission oil cooler line disconnect for Ford and GM vehicles. Fuel line disconnect tool for 1990-1994 Ford Ranger, Explorer, Bronco II. Heater hose disconnect tool for Ford Aerostar vans and Econoline vans and Chrysler vehicles. Oil cooler disconnect tool for Ford vehicles. Clutch coupling release tool for Ford trucks and Cougar/Thunderbird. Fuel line disconnect tool for Chrysler vehicles. Heater hose disconnect tool for GM vehicles. Long-handle disconnect tools for Ford and GM fuel lines. Scissors-style fuel line disconnect tools 5/16″, 3/8″, and 1/2″ for Ford and GM vehicles. Toyota A/C line disconnect tool. GM hydraulic clutch line disonnect tool. GM oil cooler disconnect tool. 1/4″, 5/16″, and 3/8″ universal disconnect tools. Universal transmission line disconnect tool. Comes in blow-molded plastic case.